Porting A Phone Number is Easy! 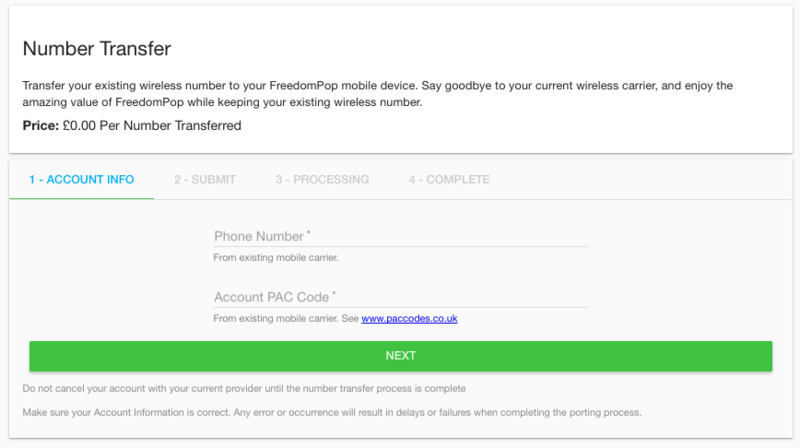 You can port your phone number into your FreedomPop account from another carrier, for £4.99. You will need the PAC code from your previous carrier and the account with your previous carrier must still be active. Make sure you have a FreedomPop phone number on file before you start the porting process. You won’t be able to port your phone number in from another carrier, if you do not have a number on file already. Please click here, to learn how to get a new FreedomPop phone number for free. Once this is done, you can start the porting process. Please Note: If you are looking to transfer your FreedomPop account phone number out to another carrier, please post a comment below requesting this and a Community admin will be glad to assist you. To Start, click here and log in with your email address and password. If you are not using the link, you can also log in and from the home page, click on Devices. Then click Transfer Number to start the process. From here, you will be asked to enter your PAC code and the phone number you plan to port.